Star Max found plenty in the closing stages to run out a game winner of the rated novice hurdle at Limerick. Joseph O'Brien's charge was taking a drop in grade today having finished mid-division behind stable-mate Band Of Outlaws in the 'Fred Winter' at Cheltenham 18 days ago. Rachael Blackmore tracked the leaders on the well backed 4/1 shot (8/1 this morning) before producing him to lead turning for home. The Gigginstown gelding was joined by Foreign Secretary after the second last and after seeing off that challenge on the run-in had to repel the late charge of Lever Du Soleil to record a half length win. Star Max was recording his second success of the season having also won a maiden hurdle at Gowran last month. "He had a disappointing run the last day in Cheltenham when we thought he'd run a bit better but he jumped well today and Rachael gave him a lovely ride,” said O'Brien. "He could go on for a Graded race at Fairyhouse next as we have nothing to lose and see how we go." There was a second winning favourite in as many races at Cork with Landofhopeandglory (7/4 into 6/4) doing the business in the UCC Horse Racing Society Hurdle. Second market choice Dr Mikey (5/2 into 7/4) was the one to give the J P McManus-owned and Joseph O'Brien-trained Landofhopeandglory most to do. Two lengths eventually split them after the Mark Walsh-ridden victor had taken over from the last. "He thinks about it a bit and I'd say he was in two minds coming up the straight whether he'd go through with it or not but the good jump at the last helped," said McManus racing manager Frank Berry. "He thinks about it a bit over fences too but today's race was a lovely race to find and he can go back over fences now. He has been a little disappointing over fences but we'll see where we end up now. "He likes things his own way but it was lovely to win another race with him." Darasso kicked into gear in the closing stages to land the Toals.com Webster Cup Chase at Navan this afternoon. The Joseph O'Brien-trained gelding was heavily supported from 15/8 this morning into an even-money shot as he tackled Irish fences for the first time. Barry Geraghty held his mount up in the two-miler and he took a bit of time to warm to his task. The French-bred was pushed along in third before the straight and Geraghty had to get serious two from home as Cadmium travelled sweetly in the lead. Darasso picked up well to lead going to the last, however, and kept on strongly on the run-in to secure a two-and-a-quarter length success in the Grade 2 feature. The winner had won twice over fences in his native land and had been impressive when taking the Red Mills Hurdle at Gowran on his last outing. Geraghty said afterwards:- “There’s no doubt he’s a good horse but he was also facing horses that didn’t go (to Cheltenham) last week, not meaning to be disrespectful - but horses of a level. “He’s a nice type but the ground probably suited us better than the second horse. He has a bit to work on with his jumping but it’s his first run over our fences. Shane Shortall gave Christopher Robin a strong drive to get the joint-favourite home in the opening maiden hurdle at Wexford this afternoon. The Joseph O'Brien-trained gelding went to post a 5/2 shot for the two-miler and chased the leaders throughout. Shortall sent his mount up to tackle front-runner Cobaltic two from home but he had to work to get the better of that rival going to the last. Fellow market leader Fiveallin also tried to challenge at the final flight but Christopher Robin found more on the run-in to secure a three-parts-of-a-length win over Cobaltic. Advanced Virgo stayed on for third, a neck back, and he was just three-parts in front of Fiveallin in a tight finish. Christopher Robin had been well beaten at Navan on his previous run, when he lost a shoe, but had run well before that when third at Gowran. Shortall said:- "On his Gowran run he was entitled to win this. He had an excuse the last day. Joseph found a good opportunity for him today and everything went right for him. He jumped and travelled well." 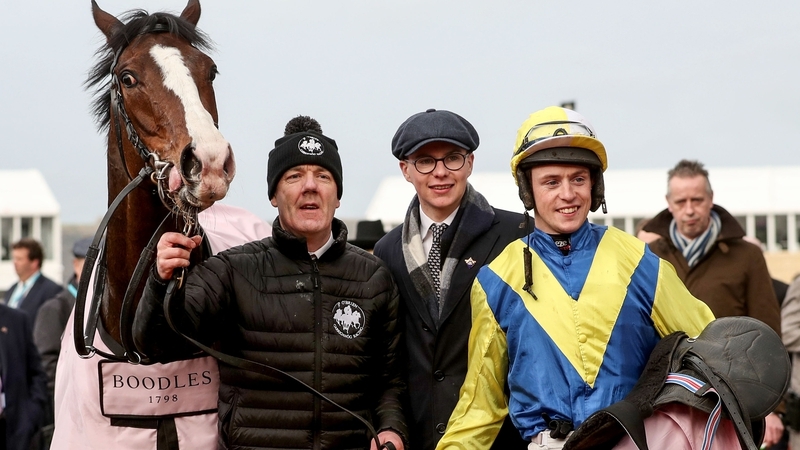 Early Doors provided trainer Joseph O'Brien with a second winner of the week and a much-needed tonic after the tragic loss of Sir Erec earlier in the day with victory in the closing Martin Pipe Handicap Hurdle. The topweight, who finished third in this race last year, looked booked for second up the home straight besides the looming favourite Dallas Des Pictons, but ultimately found more under pressure for Jonjo O'Neill jnr. "He's been running in Graded company all year and he came back to handicap company today. "Jonjo gave him a great ride and I'm delighted for him and we're very happy. Horses jump for him and he's very patient. He didn't get the break but went to plan B and did it perfectly." Joseph O’Brien believes Sir Erec has a “favourite’s chance” as he targets his first ‘official’ JCB Triumph Hurdle — three years after supervising the success of Ivanovich Gorbatov in the same race. 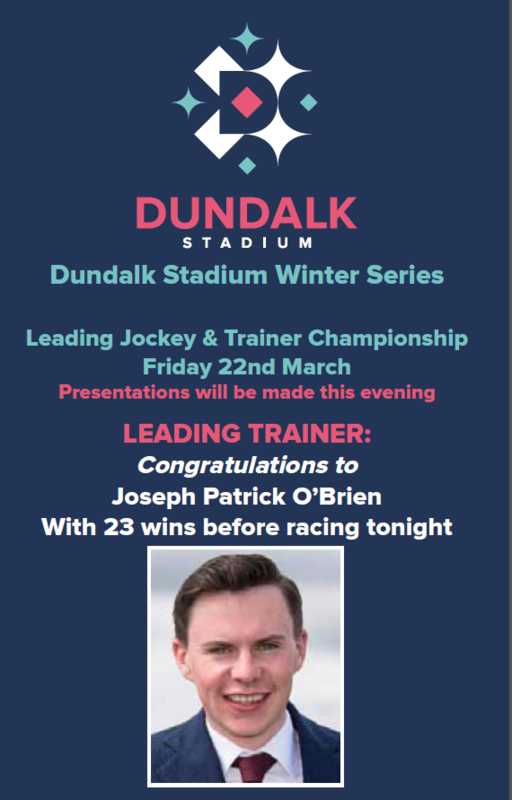 His father Aidan’s name went into the record books as trainer of the 2016 winner, but O’Brien junior was given credit for the preparation — and now has a major fancy in his own right in the four-year-old championship at Cheltenham on Friday. O’Brien, who scored his maiden Festival victory with Band Of Outlaws on Wednesday, inherited Sir Erec from his father after the Camelot colt’s decent Flat career — which included finishing third to Stradivarius in the Qipco British Champions Long Distance Cup at Ascot in October. He has transferred his smart form to jumps, with highly-promising wins in both his starts. 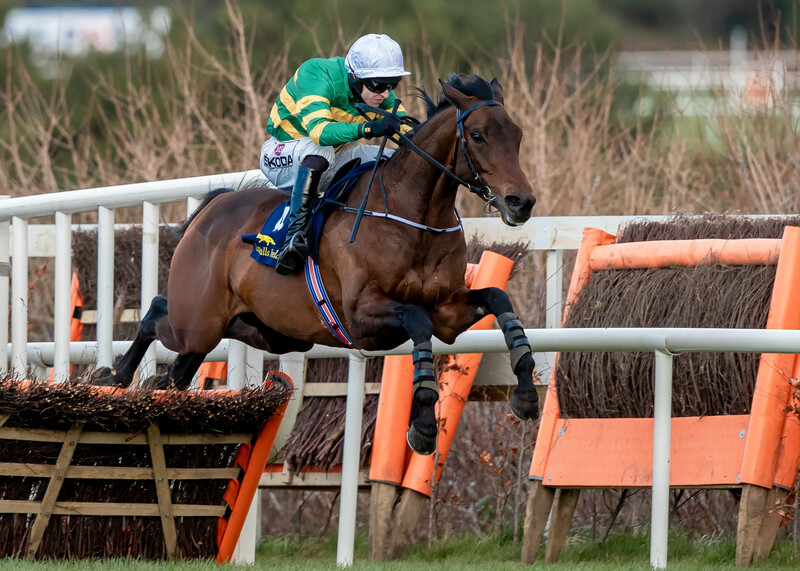 After beating 27 rivals on his debut in a maiden hurdle at Leopardstown over Christmas, Sir Erec returned to the Dublin track to lift the Grade One Spring Juvenile Hurdle by an easy six lengths in February. A slight injury scare last week failed to dampen enthusiasm for the short-priced ante-post favourite. 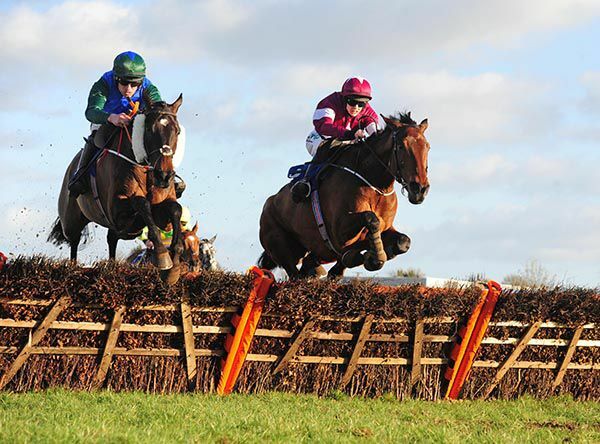 “Obviously he has taken to hurdling well,” said O’Brien. “He ran a nice race first time and improved a good bit to his second run. He’ll have to improve again, but we’re hopeful he’s capable of doing so. “Maybe the (Triumph) field might not be as big as it used to be, but all the good ones will still be there. It’s going to be a competitive race — and by far his biggest test so far — and he’ll probably have to run a career-best to win it. “We’re very realistic in that sense, but we’d like to think he has a favourite’s chance. “He was visually very impressive the last day, and I’ve never hidden the regard we hold him in. He’s very exciting. Band Of Outlaws gave trainer Joseph O'Brien his first Festival winner with a convincing two-length success as the 7-2 favourite under JJ Slevin in the Boodles Juvenile Handicap Hurdle. 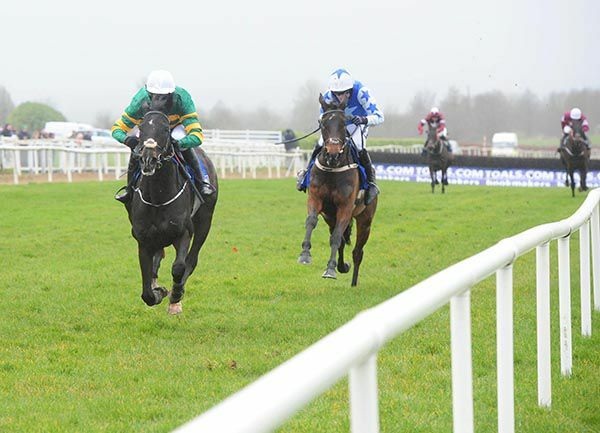 The four-year-old started out towards the rear but gradually made his way through the pack before taking over after jumping the final hurdle to beat Gordon Elliott's Coko Beach by two lengths. “Thanks very much, delighted for everyone,” O'Brien said. “JJ gave the horse a fantastic ride. We thought he was better than a handicapper and we’re over the moon. 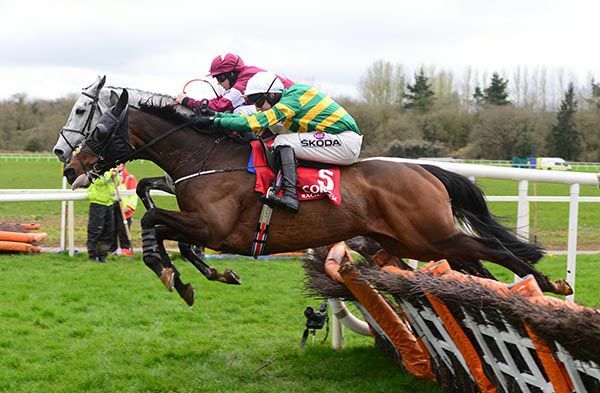 1.30 JCB Triumph Hurdle Grade 1 Sir Erec Mark Walsh Gardens Of Babylon Barry Geraghty. We may have what is probably our biggest but definitely our strongest team travelling to Cheltenham this week but as assistant trainer to Joseph O’Brien, I have to stay at home and mind the house on The Hill with the rest of the lads. Of course you would love to be over but I never lose sight of how lucky I am to be in the position I am. It is a privilege. And having gotten to go to Australia to oversee Rekindling’s preparation and then watch him win the Melbourne Cup in 2017, I can’t really complain. I am 27 now and have been with Joseph three and a half years. He is very good about trusting people to do their jobs, be it staff or jockeys. That in turn gives you a lot of confidence but it was brilliant to be given that responsibility with Rekindling first and foremost. Then to grasp it, go and do it and for him to go and win was just amazing, definitely the highlight for me. It was class. We didn’t know the facilities we would have when we arrived so we couldn’t make any plans until we arrived. They quarantine the international horses at a country racetrack in Werribee. Everyone was using the sand circuit inside the turf track. It was about a mile. We used it the first day or two but MJ Doran, who was riding him out, said it was way too quick for Rekindling so we changed tack and were one of the few to use the turf track every day. I would send videos of Rekindling’s work to Joseph and then MJ and myself would offer our opinions on what direction we should take. Obviously the final call was Joseph’s but he could only see so much so put a lot of store in our info and feedback. To be offered that responsibility, and to be so involved in the whole thing was great and then to get the result was incredible. There were no horses in our family growing up in Caragh in Kildare but my father Sean had a couple of bookie shops and I developed an interest in racing from there. And though he followed his own father Paddy into politics and was a TD for 22 years as well as holding a number of ministerial portfolios, racing held sway over politics for me. I learned to ride at Arthur Moore’s when I was in school. When I was doing my Leaving Cert, I joined Jessica Harrington as an apprentice jockey and spent some time with Kevin Ryan in England. I got about 20 rides over the course of a year. My weight was probably going to go against me but it was ability that was the biggest problem so I gave up and though being a jockey had been the childhood dream, it isn’t a decision I have ever regretted. You have to get these things out of your system and I did. It wasn’t for me. So at 18, I went off to Maynooth College to study equine business and did some yearling preps at Yeomanstown Stud. Gay O’Callaghan’s son Peter owns Woods Edge Farm in Kentucky and I did a couple of summers over there, which was a great experience. After I got my degree, I did the Irish National Stud course for six months. I knew then I wanted to do racing rather than stud work. The constant busy nature of racing suits me better I think. Peter O’Callaghan had worked for Aidan O’Brien and he told me Joseph was starting out and he would put in a word for me. I’m there three and a half years now. It was a lot smaller place when I started. I told Joseph I’d love to look after a barn or something like that and it just progressed from there to being assistant trainer as the yard grew and a need for the role developed. Faisal Hayat is the head lad. He’s been on The Hill for years, even before Joseph was. He knows every inch of the place. We never take the success that has come for granted. It wouldn’t pass you by the quality of horse we’re able to send to Cheltenham this year. We will have around 15 and it’s definitely our strongest team. Ivanovich Gorbatov was our first big winner in the Triumph Hurdle in 2016 and it has snowballed from there. Melbourne Cup winner, Irish Gold Cup winner, Derby winner, Grade 1s and Group 1s, it has been unbelievable. As I said already, it’s a privilege to be dealing with those sorts of horses. That has grown and developed. When I started, there was no expectation on my part that we would have these sorts of horses. I didn’t know they would be coming and they weren’t there then, so you really appreciate it now. But it is what the team is working towards. It is funny I suppose that being a big dual purpose yard, you have one eye on the flat season which is just around the corner, with Cheltenham on this week. We don’t even send all our horses to Cheltenham at the one time, so the Triumph Hurdle horses might not go until Wednesday, while Tuesday’s horses are there already. Then you have two-year-olds that you’re getting ready and you’d be hoping for some strong campaigns for them, and the three-year-olds that have different campaigns mapped out for them with the classic dream always there. It was a huge disappointment that Le Richebourg didn’t make it for the Arkle but that’s racing. He has won two Grade 1s and has been a star for us. We still have plenty of big chances. You’d have to think Sir Erec would be our best chance going over to repeat Ivan’s Triumph Hurdle success. 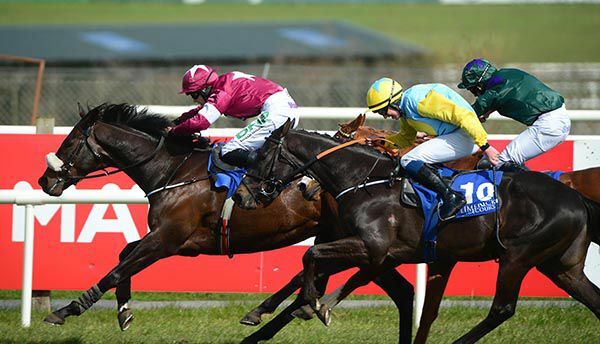 He’s got a super attitude and he jumped brilliantly in Leopardstown at the Dublin Racing Festival. Plenty of good flat horses haven’t taken to jumping and there will be plenty more. Vice versa, we’ve seen ordinary horses in the flat that blossom when going jumping. But Sir Erec has taken to jumping brilliantly and that’s down to his attitude. At Leopardstown, he had to do all the donkey work and he might not have to do that on Friday. The Triumph is always fast and he won’t mind a true test at all. Us And Them seems to be the forgotten horse in the Arkle, even though he’s been second twice to Le Richebourg, who was favourite for it, and with the rain coming, you’d have to think he’ll run a big race on soft ground. Fakir D’Oudairies won’t mind a bit of rain, Band Of Outlaws has a good chance in the Fred Winter — we’ve a good strong team. We will have a lot to do back at The Hill but we’ll get it all done in plenty time— there won’t be too many races missed! Smoking Gun got on top in the closing stages to land his fourth win of the season in the featured Thurles Handicap Hurdle this afternoon. Joseph O'Brien's charge was a well-supported 6/4 favourite as he stepped up to two-miles-six for the first time in the €18,000 event. Rachael Blackmore did the steering again on the Gold Well gelding having partnered him to success at Gowran last month. He was produced to challenge two from home and had a narrow lead from Plan Of Attack before the last. That rival battled back to have a narrow advantage at the final flight bu Smoking Gun found plenty on the run-in to get up for a three-parts-of-a-length success. "He is improving away as we are stepping him up in trip. Rachael gave him a very good ride and I'm delighted,” said O'Brien. Joseph O’Brien has revealed JCB Triumph Hurdle favourite Sir Erec has suffered a minor setback — but is still expected to be fit for the Cheltenham Festival. A high-class performer on the Flat, the Camelot colt has won each of his two starts over hurdles at Leopardstown this season — most recently dominating his rivals in the Grade One Spring Juvenile Hurdle last month. He is a best priced even-money favourite for the juvenile championship on Friday week, and O’Brien remains optimistic he will take his place in the field, despite revealing on Twitter his charge had picked up a stone bruise. O’Brien posted: “Just to keep everyone in the loop, Sir Erec was found to have a stone bruise this morning. Owner Martin O’Sullivan, trainer Joseph O’Brien and jockey Derek O’Connor will be hoping lightning can strike for the second time in 2019 in a Thurles bumper as Baboin contests the Fethard INH Flat Race on Thursday. In the blue and white silks of O’Sullivan, O’Connor enjoyed a dream spin on Sempo, who was very impressive in scoring a 15-length success here in February. That Oscar gelding is now a leading fancy for the Weatherbys Champion Bumper at the Cheltenham Festival next week and in recent months Baboin has joined him as a stable companion at O’Brien’s Piltown operation. Baboin is by Footpad’s sire, Creachadoir, and he’s a half-brother to Bapaume, last seen in action when runner-up to Presenting Percy in the Galmoy Hurdle at Gowran. The five-year-old’s three appearances thus far came when he was under Paul Nolan’s guidance, and he was not disgraced when runner-up in a Cork maiden hurdle last May. That effort was sandwiched by a couple of poor performances in bumper company, so it is hard to predict what might be forthcoming now. However, Baboin was only a four-year-old then and he could well come forward having strengthened up off a 293-day break. A change of scenery may not have done him any harm either.